The younger volcanic craters are all less than 500,000 years old. They formed after Oʻahu had moved well off the hot spot and the main shield volcanoes had gone dormant for at least two-million years. “Here at Diamond Head, which is one mile in diameter, the bulk of the mud spread out half a mile in all directions before ending its fall. Thus a very exact circular ring was piled up of one mile in diameter. There was, however, another influence, that of a violent easterly-wind which deflected the entire fountain westward”. Somewhat more than half of the craters of southeast Oahu are arranged in linear groups, those dominated by the craters Tantalus, Diamond Head, and Koko Crater. In the Diamond Head group is the main Diamond Head vent, Kaimuki crater and Mauʻumae crater. 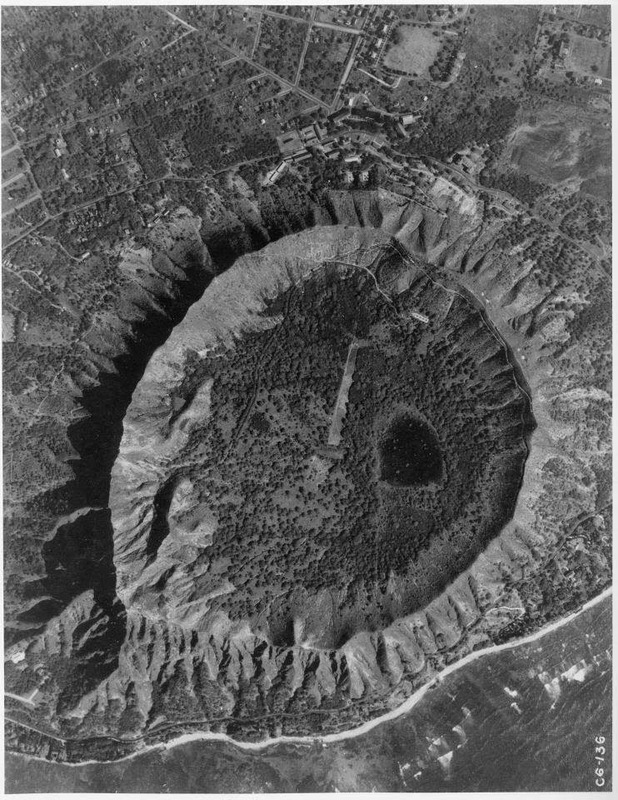 The image shows a 1928 aerial of Lēʻahi, Diamond Head. In addition, I have added others similar images in a folder of like name in the Photos section on my Facebook and Google+ pages. Pu‘u O Kaimukī (aka “Kaimukī Hill”) was used as a sighting and signal station (using semaphore technology,) giving it the name “telegraph hill.” It had broad view over the Pacific and line-of-sight to downtown Honolulu. Back then, they used this vantage point to spot ships coming in, and then conveyed the news to Honolulu. Semaphore towers used arms and blades/paddles to convey messages; messages were conveyed/decoded based on the fixed positions of these arms. Reportedly, in 1857, a semaphore mechanism on Puʻu O Kaimukī, with large moveable arms, was attached to the top of a sixty-foot pole and used to signal to Honolulu. The official receiving station from Kaimukī was on Merchant Street, but some have suggested other receiving stations at Kaʻahumanu Street and the foot of Nuʻuanu. Following the call, HECO’s whistle would scream three long blasts, loud enough for all Honolulu to hear. This meant the ship would arrive in two hours, and people rushed to the harbor. He was better known as Diamond Head Charlie. 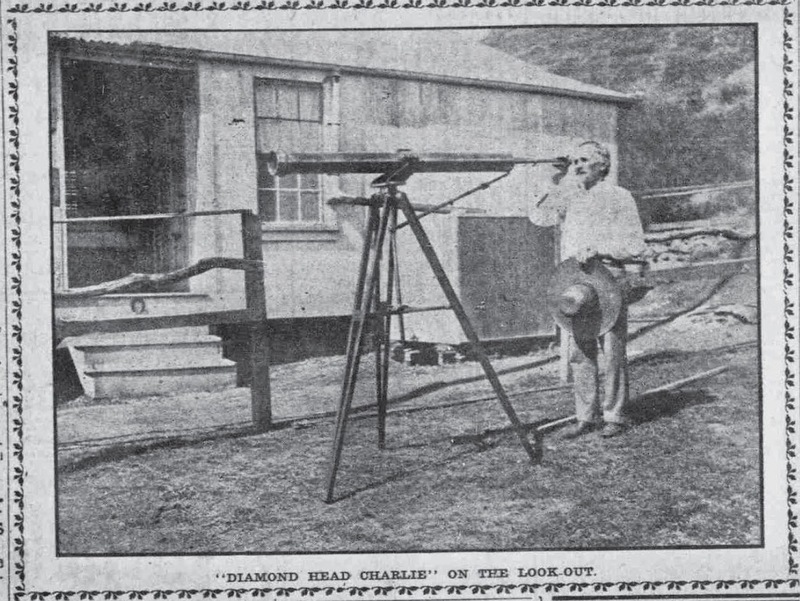 The image shows Diamond Head Charlie and his telescope outside his house. (Pacific Commercial Advertiser, January 29, 1906) In addition, I have added others similar images in a folder of like name in the Photos section on my Facebook and Google+ pages.